Canterbury have moved up to second in National Two South following a narrow bonus-point win over promotion rivals Henley Hawks. The Hawks had been on a seven-game winning streak heading into Round 12, but the City Men continued their own form as a fifth consecutive victory lifted them into the top two. Andy Pratt’s side are now nine points behind leaders Rams RFC who waltzed to a victory over Worthing Raiders at Old Bath Road. Also, Tonbridge Juddians are just five points off the promotion places after a superb display against Taunton Titans while Old Albanian maintained their excellent run after triumphing over Birmingham and Solihull. At the wrong end of the table, there was a huge result for London Irish Wild Geese as they defeated Guernsey to reignite their push for survival while elsewhere, Redruth edged past Barnes, Dings Crusaders secured the bragging rights against Old Redcliffians and Clifton narrowly beat Bury St Edmunds. Rams RFC beat Worthing Raiders to secure their eighth successive victory in National Two South and the league leaders are now nine points clear at the summit. Seb Reynolds’ side were able to tighten their grip on top spot after second placed Henley Hawks lost to promotion rivals Canterbury. Rams led 29-0 at half-time, with Ben Henderson (2), Greg Illingworth, Niall Kidd and James Baker scoring tries. Michael Etete and Joe Duffelen added touchdowns in the second period, while Alex Seers contributed a total of two conversions with Jamar Richardson also landing a kick. Worthing scored all of their points in the second half, with Matt Walsh and Harrison Sims both crossing. Oli Best produced an excellent display as Canterbury beat fellow promotion candidates Henley Hawks to move up to second in the National Two South standings. Best converted his own try and kicked a penalty in the first period to help his side into 20-10 half-time lead, with Sam Sterling also crossing twice for Canterbury. Best grabbed his second score to increase the lead before Henley rallied impressively. Alex Bradley crossed for the Hawks before Tom Emery added to his first half effort, and Sam Lunnon’s earlier try, to move the hosts to within five points of Canterbury. However, Dan Smart’s score just after the hour proved to be enough for the City Men and despite Emery completing his hat-trick late on, Canterbury held firm for their fifth victory on the spin. Duncan Tout and Will Robinson both scored twice as Tonbridge Juddians sealed an impressive victory over Taunton Titans. 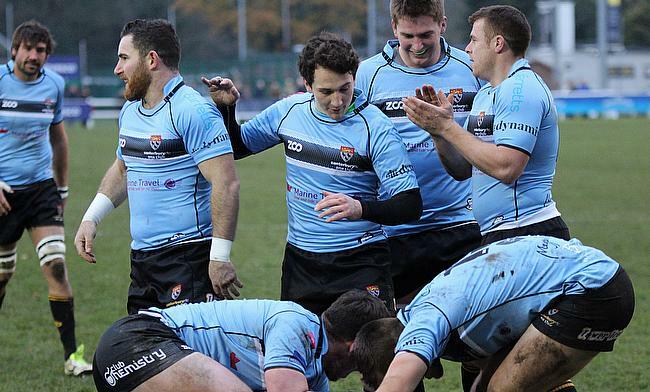 Following wins against Guernsey, Old Redcliffians and Dings Crusaders, the seven-try TJs made it four wins on the bounce in Round 12. Other tries from Toby May, Murray Galbraith-Lowe and Ryan Jackson sealed the victory. Taunton’s points came via Chris Francis and Ollie Rice while Gary Kingdom also slotted a penalty as the visitors fell to their third straight defeat. Old Albanian claimed their fourth victory in a row as they beat Birmingham and Solihull to move up to fifth place in National Two South. Tries from Chris West and Tom Bednall put OA’s in charge at Woollams in the first period. And that’s a win for the #OAs at home 32-15! Great match @BSBeesRugby and best of luck for your remaining matches! Nicholas Bingham’s try and scores from Luke Smith and Mike Hagan reduced the deficit to five points before OA’s went over in quick succession. Morgan Thompson and Ross Hamilton both crossed to round-off the win and OAs are now seven points off the top two places. Thomas Notman’s try just after the hour earned 14-man Redruth a victory over Barnes in National Two South. Rupert Crossland put the hosts in front, before Jack Oulton hit back with a try of his own for Redruth. Matt Cornish gave Barnes the lead after half-time and the hosts looked favourites to extend their winning run to six matches when Redruth’s Mark Grubb was sent-off on 54 minutes. However, the visitors didn’t crumble and Notman’s converted try was enough to earn Redruth a first win since the middle of October. Dings Crusaders returned to winning ways and did so in style following a derby day victory over near neighbours Old Redcliffians. First-half tries from Stean Williams and Harry Tovey, as well as a penalty from Ben Bolster, gave Dings a 15-6 half-time lead. Ash Challenger’s try increased the visitors’ lead to 16 points, but Chris Pursall’s effort did give Old Reds a route back into the game just before the hour. However, the hosts couldn’t add any more points to their tally as Tovey’s second try secured the victory for the Crusaders, who have won both of their Bristol derbies this term. Clifton came from behind to beat Bury St Edmunds and secure an excellent win which leaves them seven points clear of danger in National Two South. Mark Kohler’s try put the home side 5-3 up at the interval, with Brad Barnes slotting a penalty for the visitors. Kohler doubled his and Bury’s tally in the second half, but Clifton rallied and Chris Rovery’s converted try levelled the game up at 10-10. Franco Catuogno put Nick Wakley’s side back in front from the tee, however, the Lavender and Blacks had the final say as Will Pomprhey squeezed over to clinch a first win in five for Clifton. London Irish Wild Geese claimed a potentially vital win over relegation rivals Guernsey at Footes Lane. Final whistle has blown and a victory wasn’t on the cards today. A slow game from the Raiders until they picked up the pace in the final 10 minutes to score two tries and secure a losing bonus point. Bamidele Fadahunsi’s second half try for Wild Geese sparked a dramatic final 10 minutes as Guernsey mounted a fightback. Dominic Rice and Owen Clemett both crossed, but it was too little too late for the hosts, who are now in the bottom three while the Wild Geese have moved to within two points of safety.